When I turned 18, I founded a company called Tiny House Belgium. Our mission was to Built, Design, and Promote Tiny Houses and smaller living. 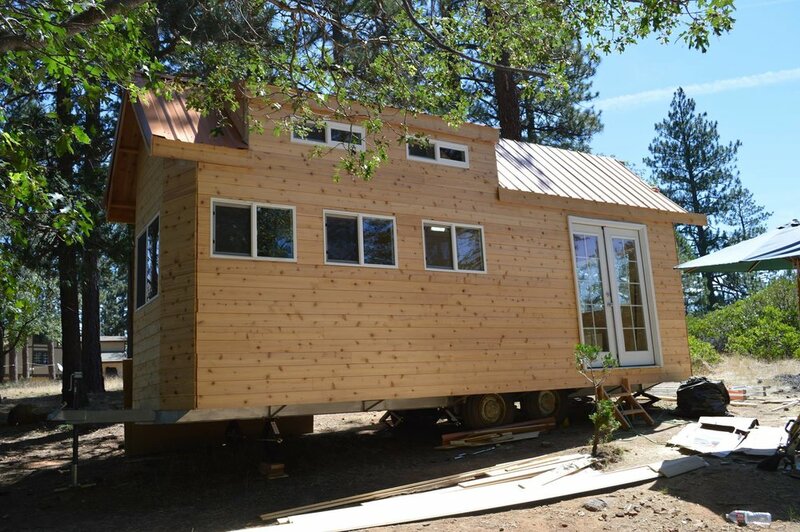 I found out about Tiny Houses and their movement in California a year earlier, in April 2015. I’ve loved the United States for a while, being born and raised in Belgium, and I wanted to spent more time there. Being 16 at the time, I didn’t really have the money to stay abroad for 3 months, so I started looking for people I could stay with and found people in The Netherlands that have a second home in CA. They were the ones that knew about Tiny Houses and with my previous experience in woodworking and construction, they asked me to build them a Tiny House. So I flew over to the USA, a few months after first meeting them, and I gave it a shot. The picture below is the final result of that Tiny House. It took me about 3 months to build and they had to finish a bunch of stuff, but it turned out great! After returning from California, I started building my own house in my cousins backyard. (As seen in the picture op top). Friends kept asking me how the build was going, and soon after I started getting emails from friends of friends asking about my progress. So I made a facebook page where everyone could follow my built. This was the start of Tiny House Belgium. I started THB (Tiny House Belgium) in 2016 and ren the company for a year. I learned a lot about the Tiny House world, the customer demographic, building processes, marketing, sales, customer relations… But what intrigued me most was what type of people Tiny Houses attracted. Coliving and Tiny Houses are very similar in that sense that they are both trying to fix the same problems. As mentioned before, housing is becoming incredibly pricy. Both, Tiny Houses and Coliving are trying to fix that. If you think about it, these are the only 2 systems that can fix the problem: You can go live smaller, or start sharing spaces. As stated before, I stayed in a Coliving space in New York City last year for about 6 months and actually, while I’m writing this article, I’ve been in the same coliving space. I didn’t intend to stay in a coliving space before I got to New York, but somehow I stumbled up their website and I booked a room. (This is 4 days before the day I was supposed to leave). So without any expectations, even without knowing what a coliving space is, I left for New York. The Coliving space I signed up for was in a Brooklyn neighborhood called Bedford-Stuyvesant. The Space had 2 floors, the second and the third floor of the building. It took me about a month to really start understanding coliving. In the beginning, Before the end of this month, I really thought the only reason anyone would ever open up a Coliving space was to fit more people into one apartment which makes rent cheaper for everyone. Which is great on it’s one, but I later realized it’s so much more then that. I wrote about this concern and 9 other concerns I have about the coliving industry in this article. After this first month the company I was staying with offered me to move to a new coliving space they just opened up a few blocks away. The place was way cleaner and more modern, so of course I said yes. This is where I learned Coliving can be so much more then ‘sharing space’. I’m gonna write a separate article about things I’ve learned about the Coliving space later. In this article I really want to keep the focus on how I got into the industry. The reason I was on this trip to New York in the first place, is because my dream is to move here one day. And I strongly believe it’s way easier to do that when you’re actually here then hoping something will happen for you 8000km away. Having sold my company in the year before, I wasn’t quite sure what career path I wanted to pursuit, so I started experimenting. About half-way trough my trip, I started a blog over on my website, talking about: Business, Marketing, innovation and Technology. These are all areas I was, and still am, very fascinated by so I wanted to learn more about them myself and share what I found out in the mean time. In September, I decided on marketing and social media content creation/strategy. I knew it wasn’t what I wanted to do for the rest of my life, but it was the best I could do at the time. And I actually still enjoy it in some ways! The week before I left New York, I actually proposed Outpost Club to work for them in marketing, for free, till January, to build my own portfolio, have a channel to try things out and so on. They agreed, and I’ve been working for them till this day. In the 4 months I worked for them remotely, I learned a bunch about the workings of the company in that time. From operations, to customer relations, PR, partnerships, seeing the growth of the company… So in January we had the call. What did you think about my services, and how did I like it? While not as easy as it sounds, working remotely and for a company I don’t know that well, things went pretty well and we agreed to me coming back to New York and working for them here for at least another 3 months. Because that’s how long I’m allowed to stay here on my current visa. And that is how I got into the Coliving industry! There is so much happening behind the seance right now I can not talk to you about just yet, but trust me, it’s sweet ;) I’ll keep you guys posted a soon as I can!